A faded musician sees his plans turned upside down when his beloved dog runs away and crosses the buffer zone that separates the “Greek South” from the “Turkish North”. Can he smuggle him back in? Nicosia 2016: Cyprus is still recovering from the economic crisis while talks for reuniting the island are back on the table. The life of YIANNIS (early 40s), a Greek-Cypriot faded musician, hasn’t particularly turned out as he envisioned it. His girlfriend left him, he can’t cough up his rent, and his mobster creditors are breathing down his neck. His plan: to leave the island, as soon as possible, with his only loyal friend, his beloved dog JIMI. Everything is arranged and nothing stands in his way, as long as he manages to hold on to his meagre savings stacked away in his old guitar and lay low for four more days. 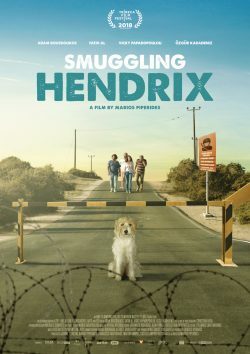 Yiannis’ plan gets disrupted when Jimi runs away and crosses the buffer zone to the Turkish controlled side of the island. He has no option but to put his personal objections towards crossing to “the Turkish side” aside. However, when he finds Jimi he is confronted with a ludicrous European Law prohibiting the crossing of animals from the Turkish to the Greek side. Yiannis is stuck, pondering on a way to bring his dog back. The quiet existence of HASSAN (40), a Turkish settler and family man, is interrupted when Yiannis – with his creditors hot on his heels – unexpectedly shows up at his house. Yiannis confesses to Hassan that their meeting was not purely coincidental. Hassan’s house belongs to Yiannis’ parents, who had to flee the property after the Turkish invasion of 1974 and have not been able to return ever since. After a heated discussion, Yiannis claims that Hassan took his house, an accusation that gets Hassan fuming. Yiannis promises Hassan that he will never bother him again if he can help him smuggle Jimi back to the Greek side. Hassan, eager to get rid of Yiannis once and for all, agrees to help him and introduces him to TUBERK, a Turkish-Cypriot small-time crook who can smuggle Jimi across the “border”. The operation goes terribly wrong and ends in Jimi being locked up in a holding pen on the Turkish side, awaiting an unknown fate. To make things worse, Yiannis’ creditors close in on him, beat him up and strip him off his passport and ID, preventing him from crossing back to the Turkish side of the divide. Beaten and desperate, Yiannis is left with only one option: to call on his ex-girlfriend KIKA, a street-smart beauty who knows a thing or two about the “underground tracks” of the old city. Yiannis also knows that Kika has always had a weak spot for Jimi, ever since the two of them took him in as a little puppy. Kika, who now lives with the successful GEORGE, although furious with Yiannis, agrees to lead the way through a secret path in the buffer zone. After a short ordeal, they manage to cross to the other side. They find Hassan, and then Tuberk, who suddenly seems to be suspiciously caring about Jimi’s fate. The eclectic foursome manage to free Jimi and after a tense off road journey arrive to the safety of Hassan’s house. But, once inside, the tension only rises. Jimi seems unwell and Tuberk admits that he had the dog smuggle drugs in his stomach. Hassan announces that he had enough and kicks everybody out of his house. Yiannis, desperate and aware of the fact that Hassan is his only lifeline, makes one final attempt to convince him to smuggle Jimi back, this time on a boat, that will go around the island. In return, Hassan will get Yiannis’ Cypriot passport, which will be a way out – to Europe – for the “illegal” Turkish settler whose future on the island looks grim. Hassan agrees. The “minor” detail that his passport is in fact in the hands of his creditors, Yiannis conveniently fails to disclose. By the time Hassan realizes that he’s been conned it’s too late to turn the boat around. The Cyprus Navy Patrol has already spotted them. They speed to shore, only to realize that Jimi has taken off again, back into the buffer zone that is adjacent to the shore. With Kika injured from jumping from the boat and the police on their heels, searching for Jimi is clearly not an option. When finally back in Nicosia, Yiannis spots movers carrying his belongings down to the street. Not only he is getting evicted, but once more his creditors are waiting for him and this time the beating is worse than the first time. Adding insult to his beating, George informs him that he has taken care of his debts and hands him his passport and ID, on the condition that he will leave the island for ever and stay away from Kika. Yiannis realises that it’s time to stop running away from his problems and face the consequences of his actions. Rather than using his meagre savings to leave Cyprus, he hands them over to George, not accepting his gesture to pay of his debt, and tells him he will give him the rest in a few months time. And as promised, he hands his passport to Hassan, who doesn’t seem to be too keen on leaving Cyprus anymore either. Yiannis and Hassan, exhausted and roofless, break into an abandoned house nearby the buffer zone. Yiannis assures Hassan that this is not over, that he will get his house back. Hassan shrugs. They both lay down as their chats transform into incoherent mumbles. Their differences and dispute will still be there, but through their adventure they came to understand each other more and realize that what they want is not actually what they need. In the final scene, we see Jimi wandering the streets of Nicosia on his own. He approaches the check point from the Turkish side. Neither the Turkish nor the Greek officers pay any attention to him as he continues walking to the Greek side, minding his own business.